Add oil, thyme, Scotch bonnet, brown sugar, ginger, soy sauce, lime juice, garlic, allspice, cinnamon, lime zest, salt and pepper to a food processor. Pulse until combined. Toss pork chops with jerk marinade. Cover and chill for at least 1 hour. Grease grates well and preheat grill to medium-high heat. Grill the pork chops for 4 to 6 minutes until medium or until juices run clear and chops are a blush of pink in the centre. Let rest 5 to 10 minutes before serving. 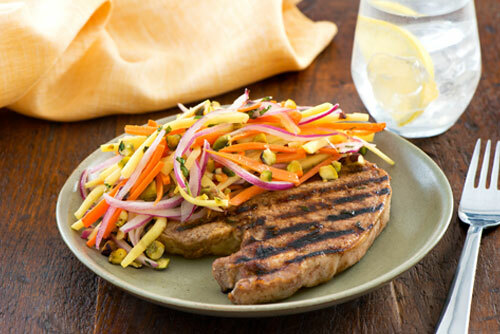 Serve with Mango-Carrot Salad. Stir carrots with mango, red onion, vinegar, oil, ginger, sugar and salt until well combined. Stir in mint. Garnish with pistachios. Always wear rubber gloves when handling hot peppers, like Scotch bonnet peppers. If you prefer a milder flavour, substitute jalapenos for Scotch bonnet peppers.